That might be too aggressively sloped up near the top, but it’s a start. It’s perfectly manifold and slices just as you’d expect; you could affix it to a mounting bracket easily enough. The t index determines all the other values as a function of the layer from the base at t=0 to the top at t=0.99. The shape() defines the overall triangular blade cross-section at the base; change the points / size to make it look like you want. The path() defines the XYZ translation of each slab that’s extruded from the shape() cross-section. I think the Z value sets the offset & thickness of each slab. The constant 100 in the X value interacts with the overall size of the shape(). The 90 values inside the sin() function set the phase & scale t so the claw bends the right way; that took some fiddling. The parameters in scaling() determine how the shape() shrinks along the path() as a function of the t parameter. 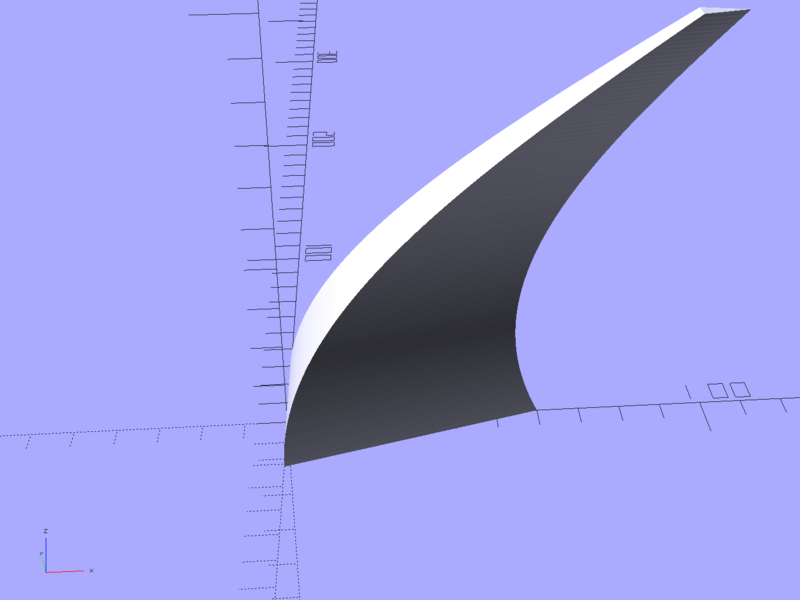 The 0.1 Finagle Constants prevent the claw from tapering to a non-printable point at the tip. I think the Z value must be 1.000 to avoid weird non-manifold issues: the slabs must remain whatever thickness the sweep functions set them to be. It compiles & renders almost instantly: much faster than I expected from the demos. The folks who can (and do!) figure that kind of model (and the libraries behind it) from first principles have my undying admiration!